Last weekend, the Islamic Society of North America's (ISNA) annual conference in Houston, TX hosted dozens of prominent Islamists and boasted an attendance of approximately 20,000 people. 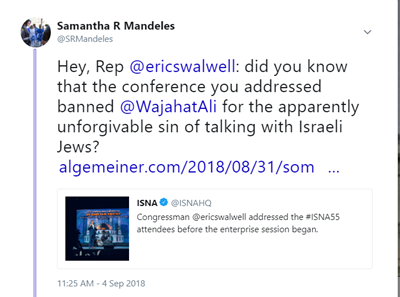 Somehow, despite the wealth of evidence showing ISNA's long history of extremism—and its habit of inviting hate preachers to speak at its events—the organization's convention still manages to attract the participation of mainstream American politicians. 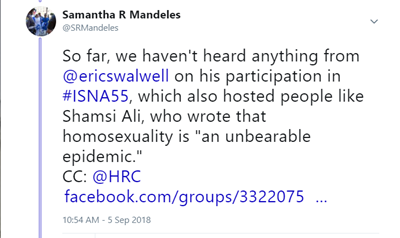 Following this year's conference, ISNA proudly revealed the involvement of California Democrat Congressman Eric Swalwell with a September 3 tweet about Swalwell's speech before a session on enterprise. 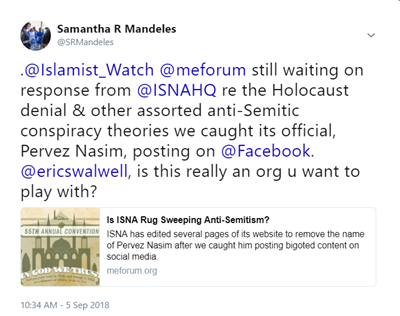 Having just published multiple pieces about ISNA officials' dissemination of Holocaust denial, refusal to condemn anti-Semitism, and ostracism of those Muslims who dare to dialogue with Israeli Jews, we tweeted to ask Congressman Swalwell for comment—both on ISNA's behavior and on the politician's own association with the group. So far, Congressman Swalwell has not responded.